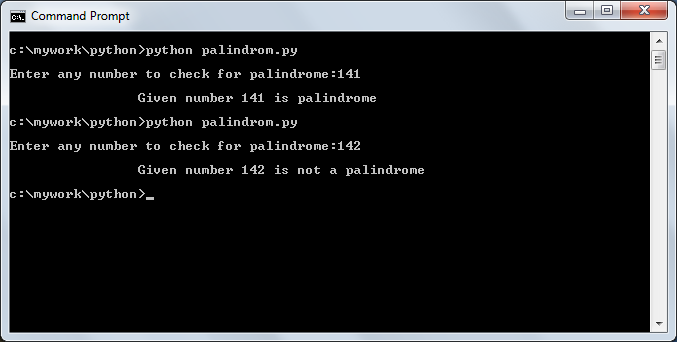 In this post we shall learn how to find whether given number is a palindrome or not using python language.We have already seen palindrome program in C,C++,Java.By definition a number is called as palindrome if the reverse of the number is same as the original. Explanation:Consider that the given number is 142.Now that number is copied to temp variable.While loop checks the temp variable.If the value is greater than 0 then it can enter the loop. In the loop, the remainder of the % operation is stored in remainder.i.e 142% 10 gives 2 as remainder.The ‘/’ operator gives the quotient of division and it is stored in temp.i.e 142/10 gives 14 and stores it in temp variable. Before to the loop the reverse variable is initialized to the 0.Now that 0*10+2 = 2 is stored in reverse variable.In this way loop is iterated till the condition is failed. print "\n\t\tGiven number " +str(n)+" is palindrome"
print "\n\t\tGiven number " +str(n)+" is not a palindrome"
This entry was posted in Python and tagged palindrome program in python using for loop, palindrome program in python using recursion, palindrome program in python using reverse method, palindrome program in python using string, palindrome program in python using stringbuffer, palindrome program in python using while loop, simple palindrome program in python, string palindrome program in python. Bookmark the permalink.